Allows the queen hero to create creep tumors. Each creep tumor is burrowed and creates a patch of creep in a radius of 6. Allied ground units within this radius gain +30% movement speed and +0.25 life per second. Mutalisks spawned by the computer player also benefit from creep. The hero requires a creep tumor charge to use this ability, can carry up to 3 charges. Allows the queen hero to spawn larvae. Larvae are weak melee units that can only attack ground units. The damage and life of the larvae scale with the hero's level. Cannot have more than 20 larvae. Level 1: Spawns 4 larvae. Larvae deal 5 damage, have 1 armor and have 30 life. Level 2: Spawns 4 larvae. Larvae deal 7.5 damage, have 1.5 armor and have 40 life. Level 3: Spawns 4 larvae. Larvae deal 10 damage, have 2 armor and have 50 life. Allows the queen hero to instantly restore life to friendly units or structures. The life healed scales with the hero's level. Level 1: Restores up to 40 life. Level 2: Restores up to 60 life. Level 3: Restores up to 80 life. Allows the queen hero to construct spore cannons. Spore cannons take 10 seconds to build and are immobile structures that can attack ground and air units within a range of 8. Spore cannons gain detection at level 3. The life and damage of spore cannons scale with the hero's level. 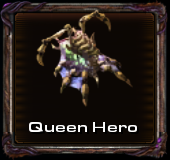 The queen hero cannot have more than 24 spore cannons. The hero requires a spore cannon charge to use this ability and can carry up to 3 charges. Level 1: 140 energy cost, hero gains 1 charge every 28 seconds. Level 2: 105 energy cost, hero gains 1 charge every 21 seconds. Level 3: 70 energy cost, hero gains 1 charge every 14 seconds. Allows the queen hero to cast shockwave. The shockwave stuns enemy units within a radius of 12 for a short period of time. Level 1: 3 second stun. -Nydus Watchers are no longer cloaked. -Nydus Attacker vision range increased from 0 -> 6. -Nydus Watchers now have flying vision.